Playseat® Project CARS - Voor al je racegear! Dit is de officiële, gelicenseerde Project CARS racestoel van Playseat®! De herkenbare, kleurrijke Project CARS logo's en afbeeldingen zijn gecombineerd in één supergaaf design op de zitting en het frame van de stoel. De stiksels zijn van zeer hoge kwaliteit en bestaan uit de officiële, unieke Project CARS kleuren. Het ijzersterke zwarte frame is bekleed met comfortabele zwarte alcantara, de stof die ook voor stoelen in echte racewagens gebruikt wordt! De Playseat® Project CARS kan gebruikt worden door zowel volwassenen als kinderen, dus is ook geschikt voor je vrienden en familie. De stoel is zeer comfortabel en stabiel en kan voor iedereen juist ingesteld worden. Dankzij het unieke, gepatenteerde design is deze stoel inklapbaar, zodat het weinig ruimte inneemt als je er geen gebruik van maakt. Race als een pro met de Playseat® Project CARS! 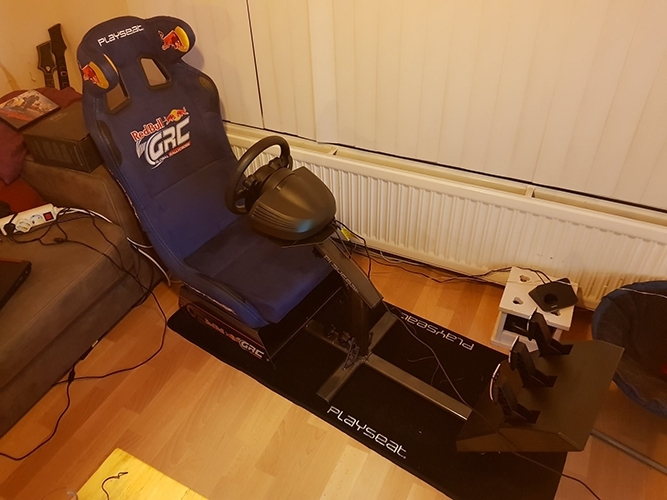 After a few weeks of clamping my wheel to desks and chairs I took the plunge on a new designated playseat and it has revolutionised my experience with the wheel. I no longer have to worry about wobbly mounting and moving pedals, you can 100% concentrate on your game. My laptimes have fallen and I'm able to play in comfort for longer periods of time without losing concentration. The seat looks great too and has tidy cable routing making things generally look more tidy in the room. I would 100% recommend the playseat to anyone with a wheel, I don't know how I lasted so long without the a proper set up! The usual Playseat high quality and to me the best looking Playseat available at the market. Fast shipping and carefully packed, great costumer service. A big thank you to Justin that was very helpful and friendly on the Playseat live chat. Orderd my playseat Project Cars, with the slider and the floor mat, waited a couple of days and BOOM... Hello mr postman :) Took me a little hour to set everything up. I was really impressed about the quality. My alcantara seat is a dream to sit in (easily adjustable), the stitching is amazing and the feel when I put in Project Cars and started racing is divine. The slider already came to good use, when my daughter wanted to drive on Spa (my favourite track). And the floor mat keeps everything perfectly in place. Best present I bought for myself in a long while. 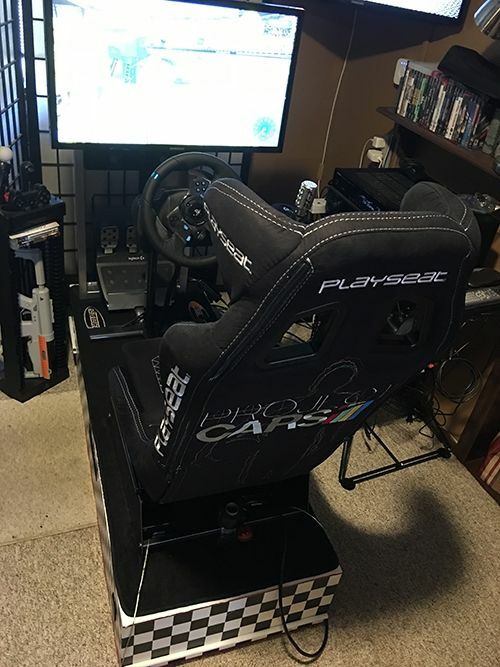 After a great deal of consideration (I already had a older Playseat Evo) I looked around the racing seat market, but could not find anything close to the Playseat Project Cars Edition. I wanted an Alcantara material seat - long racing sessions get hot! - and my existing one was vinyl. I also wanted the newer style seat with the head protection. After a quick online chat with the customer team online, I ordered from Playseat's store online, as I couldn't find this model within the UK. The unit arrived just a few days later from the Netherlands, packaged in a outer box, with the actual playseat box inside. Superb packaging inside meant nothing was marked or damaged. Just an hour of assembly to put the seat together, and then fit my Thrustmaster T500 and pedals, and some tidying of the cables (plenty ties are supplied for nice cable management) and I'm racing. Tip: Make sure you have tightened the main bolts, and re-check regularly, as any movement and flex indicates they could use more turns. The new setup is SUPERB, no other word for it. The seat is comfortable even for long endurance races (my first race was a 2 hour endurance in Project Cars!). The seat package has met all my hopes and expectations and is amazingly detailed and well designed. I cannot recommend this enough, such an improvement over desks and wheelstands etc, it really is worth the outlay - it will return it in fun ten times over!